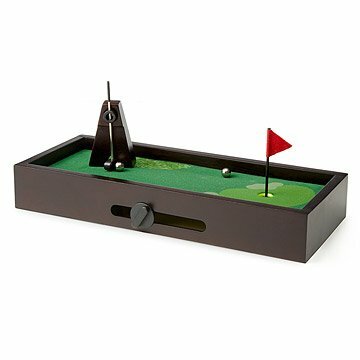 Practice your putt at your desk with this miniature golf course. My husband really loved it. He and his coworkers really enjoy playing it when they take little breaks. I gave it four stars because the flag pole is not stable. I wish it had some sort of magnet or something. I bought these for my bosses for Christmas! They are all avid golfers and they loved them! This is the perfect cup of tee for the golf enthusiast! I surprised my boyfriend with this and he was just as pleased & surprised. It's now being used and envied. My Dad loved this.. he's an old school gamer! My husband enjoys playing this during his calls and needs to keep his hands moving. He is very active so sometimes he gets restless and this helps occupy him when he needs to remain at his PC. Also, my son LOVES playing this with him. It's the perfect size, not too bulky and looks very nice. It isn't an eyesore at all.